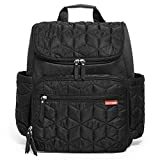 Standard diaper bags can be a bit boring for some parents so if you want to shake things up a bit, purchasing a Skip Hop Forma Backpack might be quite useful. Backpacks are convenient because they will allow you to have your hands free in order to push a stroller or carry your little one. Skip Hop does follow the latest trends and a high-quality diaper backpack was totally expected from them. The backpack is very large and spacious. Double zippers will let you access your baby’s things faster. Your hands will be free so you can almost forget that you have a bag with you. Stroller clips do need some extra adjustments so make sure they are connected properly. The bottle pockets do not have any elasticity on the top. So let’s dive a bit deeper and find out every single detail about this incredibly well designed and stylish backpack. The backpack is made of water-resistant polyester so it doesn’t let the moisture in. You can be sure that the diapers and clothes will stay dry at all times and ready for use. With that said, it is not a waterproof backpack so make sure you don’t submerge it in tall water. It is sturdy, comfortable, and easy to adjust. Skip Hop Forma Backpack is free of BPA and phthalates. It is obvious that Skip Hop makes high-quality bags because this backpack has impeccable seams. The straps are really firm and well connected to the backpack. You can also place it on a stroller because it has stroller straps as well. They might look a bit weak but they really aren’t. Just make sure that the backpack is properly connected to the handles. If the backpack is heavy and packed with various items, avoid placing it on a stroller because it might tip it. …this backpack has impeccable seams. Good padding goes a long way when it comes to backpacks. You will immediately notice that the straps are well cushioned which means that Skip Hop Forma Backpack will sit comfortably on your shoulders once you adjust the length to your frame. You can carry it for hours without feeling uncomfortable. Skip Hop Forma Backpack is quite large and spacious. It has a total of eleven different pockets that will let you organize your things properly and keep everything visible. Once you unzip the main compartment, you will see how roomy it is. The inside is clear and bright so you will have a full view of the contents of the bag. There will be no need to rummage through this backpack in order to find baby wipes or any smaller item because you will know exactly where it is. It is perfect for diapers, snacks, or an extra pair of clothes, depending on your little one’s needs. The bag has two elastic pockets on the back as well. You can also get an organizer if you feel more comfortable using one but there might be no need for that because you can still section out everything neatly. We also have to mention that the front pocket is perfect for a mobile phone, wallet, or any item you know you’ll be using often. Every compartment is secured by a zipper with the exception of the side mesh pockets which are used for carrying bottles. Unfortunately, they are not insulated which means that your drinks will not stay warm or cool after placing them in this backpack. Skip Hop Forma Backpack is quite spacious but not bulky or boxy. The backpack looks stylish when you put it on your shoulders and will become your favorite (and most useful) fashion accessory you have. It will provide you with plenty of storage space so you can carry anything you need for a day out. The exact measurements are 16 x 8 x 14 inches. It weighs around one pound when empty which is pretty light. You can choose from a total of five different colors and patterns so you will probably find the one that suits your style. …measurements are 16 x 8 x 14 inches. What we love about this backpack is the fact that it will free your hands. If you are not fond of carrying weight on your shoulders, you can always connect it to your stroller and it will become a very useful stroller bag. You will also receive a changing pad which has its own little compartment at the back. You can quickly pull it out when needed and change diapers on the spot. We have to mention that the insides can be modified and more organized by adding different boxes for various items you might carry inside. It is incredibly versatile and you can create the perfect diaper bag that is well organized and useful. However, dividers are not mandatory and you will be able to find an exact spot for each and every item you plan on carrying. As we have previously mentioned, you can transform Skip Hop Forma Backpack to a stroller bag in a couple of minutes. It doesn’t have a messenger bag strap but there is a handle at the top that is comfortable and functional. Transporting this backpack shouldn’t be a problem for anyone. You can also place your laptop in this backpack which is an excellent option when you are on the road with your family. Since the backpack already has a changing pad pocket, your computer can fit right in, as long as it is smaller than 15-inches. The design itself is pretty classic so both parents can use this backpack. Surely, the quilted details might look more feminine but if you choose the right color combination, it will look unisex. Since the straps can be adjusted, your significant other will find the perfect fit easily. The hardware is pretty strong so it will not break no matter how many times you readjust the length. You can also place your laptop in this backpack which is an excellent option when you are on the road with your family. Skip Hop Forma Backpack looks super expensive but it really isn’t. The MSRP is $70.00 and you will get a large backpack that is impeccably made and super safe. You can also repurpose it after a couple of years and use the backpack as an additional luggage option when traveling. The number of pockets and compartments is really great so this is a long-term investment that will prove to be useful in the end. From zippers to the finish, it is obvious that this backpack is really well made. Skip Hop Forma Backpack is high-quality and will not be damaged easily which is great. The maintenance is straightforward and you can quickly wipe off any stain by using a damp cloth with a bit of soap. However, putting this backpack in a washing machine is not recommended. If you really need to, use a gentle cycle and don’t place in in a dryer afterward. This is the best way to keep the structure of the backpack intact. The material will dry quickly and the bag will be ready for use in no time. This backpack can be used for years and it will still look new. From zippers to the finish, it is obvious that this backpack is really well made. Backpacks made a huge comeback last year and they became very popular among the younger crowd. So the fact that Skip Form has it as an option shouldn’t surprise you – they are a company that follows trends and try to be as current as possible. Their Skip Hop Forma Backpack is created for modern parents who want to be fashionable even when going on a stroll with their little ones. The quilted design is incredibly interesting and fashion forward. As soon as you see that the material is water-resistant, you can be sure that this backpack is perfect for parents who love spending their time outside. The look and feel of this backpack are not quite sporty but more elegant and stylish. A large number of pockets and a huge main compartment pretty much guarantee that you can carry almost anything. So pack up a blanket, a change of clothes, and anything else your little one might need on your adventure. The zippers are very useful and you can reach into the central compartment with one hand from any side. Skip Hop Forma Backpack is available in four different colors and one pattern. The shades are pretty neutral and both parents can use this backpack when needed. The modern quilted details will make this backpack stand out in any setting. So there will be no need to purchase any additional diaper bag which will save you some money for sure. It might seem like this backpack is a huge investment but it can last you for years. The material is pretty sturdy so you can comfortably use it every single day without worrying it might get damaged. Skip Hop Forma Backpack is really worth the money and organizing the contents of the bag will feel like a breeze.